Product Description This VWR 1122S digital circulating bath is ideal for highly accurate, constant temperature circulating system. 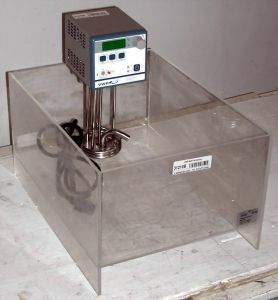 This immersion circulator has a temperature range from to 150°C±0.05°C, although with the included acrylic bath, the temperature range is only to 70C. Has a 2-speed pump for 7 or 15L/min. Immersion depth is 3-7". Adjustable flow director accepts 1/2" diameter tubing for external circulation to closed loop system. Features low-liquid cutoff and adjustable over temperature cutoff. Includes 21L bath reservoir. The bath reservoir goes to a maximum temperature of 70°C. NOT recommended for use in sous vide cooking, since it's used and although we sanitize as part of our overhaul, we cannot guarantee sterility suitable for human consumption.